Greetings from the course team. What an amazing spell of fine weather we are enjoying, we hope you are all enjoying it too. The course maintenance team including myself have been out playing a little more golf recently behind the field and enjoying the conditions. 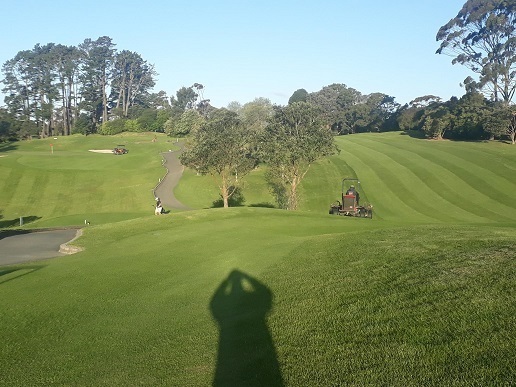 I sure you will all agree that it is great to be getting some nice ‘run’ on the fairways again. The course recovered nicely from coring, all the surfaces really enjoyed the aeration and decompaction that comes along with this vital cultural practice. However, we are still noticing a seemingly endless amount of unrepaired pitch marks and we would really appreciate your help repairing them. A good rule of thumb is to repair your own pitch mark and one other on each green for us to be able to provide a more pleasant putting experience. This link, http://www.usga.org/videos/2013/03/05/usga-course-care-video--how-to-repair-ball-marks-2204995528001.html will help explain the correct technique to use when repairing a pitch mark. You will probably have noticed a few holes being dug here and there around the course. We are doing this to repair some little issues we are having with the irrigation system and hopefully we will have these all fixed and repaired within the next week. All indications are that it could be a dry and warmer than normal summer which is what we are preparing for. Good news for all our golfers and for the golf course! We hope to see you all soon again and are looking forward to a wonderful summer of golf!